...to where I once belonged, Part 13. Yup, I'm on my way back to Blighty this evening, I'm excited. Apparently, it is 'British Spirits and Sparkling Wine Week' in the U.S.A., it is a shame I'll miss some of it. I received a nice email (from Shari Mesulam, I don't know her) that informed me that October 22nd to 28th is a celebratory week of campaigning by the British government (you'd think they'd have more important stuff to do), as part of their 'Food is GREAT' showcase. In the email, I learned that "whisky is the largest food and drink global export for the United Kingdom, and the United States is the largest export market for both British Gin and English Sparkling Wine." I could find neither aforementioned tipples in the pantry, so I had to make do with an old bottle of Vinomaker's Drambuie. It's the spirit that counts, titter, titter. So I'm going to export myself over to Blighty and hopefully do some catching up with the English bubbles bit. Just a quick Cab drive away. The Cabernet sauvignon (CS) fruit looks good this year, but it's not the best I've ever seen it. (That distinction belongs to the 2010 crop.) The CS fruit definitely doesn't look as good as the Pinot grigio, or the Syrah. A quick sugar reading today showed that the CS is at 24° Brix. 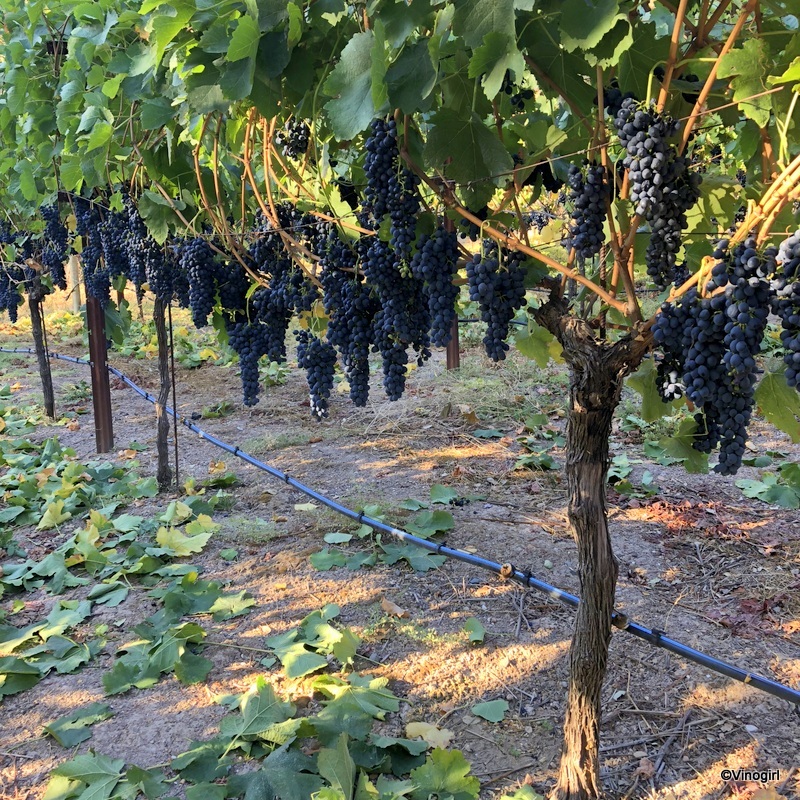 The weather has cooled down considerably, and even though there is warmer than average temperatures forecast for this weekend, the fruit is as mature as it is going to get. It's time to get the CS in. Taxi! It usually gets a little bit hectic around here as harvest time approaches. This year seems to be a little more chaotic than usual. Vinomaker and I had to put our heads together and come up with a date for our Syrah harvest. And today was the day. All went smoothly, the weather was perfect and the harvest celebration afterwards was a lot of fun. The Syrah fruit looked gorgeous and tasted great too. The yield, as I suspected, was greater than average - about 30% more. The Syrah's numbers are: 24° Brix, a pH of 3.58 and TA at 7.2. This morning was Pinot grigio harvest day in Vinoland. The fruit looked beautiful and the numbers came in at 27° Brix, a pH of 3.55 and TA at 6.75 - all in a good range. The 2018 fruit may be in Vinomaker's capable hands now, but I am already thinking ahead to next year and some critical vineyard operations that will ensure a 2019 harvest. Pruning, of course, is next up, but there is also a bit of replanting to be done. Alas, there is evidence of Pierce's Disease (PD) in some vines (nine, one right after the other, in one row and at least one vine in the row above them). The PD symptoms first appeared last year, but this year they are more definitely pronounced; foliar scorching, irregular bark maturity and raisining of the fruit, or, (as demonstrated in the above photograph) miniature clusters (a mere 2.4 inches). Oh well, it'll give me something to do next spring. This morning, as the sun rose from behind Napa's eastern hills, I was greeted with the same charred vista that has greeted me for the past 364 days. A year after the fires that ravaged Wine Country, what was once a solid ridge line of trees and vegetation across from Vinoland is still a blackened, skeletal-shadow of the verdant skyline it once was. The ridge will eventually green-up again, it is just going to take a while. I can't believe it, Vinodog 2 turns 11 years old today. Again, I ask, how did that happen? Tempus fugit, etc. After a decade of silly birthday hats, I seem to have exhausted the options available to me in the local shops, so I'm recycling a hat this year. I hope V2 doesn't mind. Actually, I know she doesn't. My little fluffy-bundle of fun is more interested in toys, treats, walkies and, the aforementioned, fun.